Jaime Balmes (Jaume Llucià Balmes i Urpià). Father Jaime Balmes y Urpiá (Catalan: Jaume Llucià Antoni Balmes i Urpià; 28 August 1810 – 9 July 1848) was a Spanish Catholic priest known for his political and philosophical writing. Balmes was born at Vic, Catalonia, Spain and baptized the same day in the cathedral of that city with the name of Jaime Luciano Antonio. He died in the same city. For two years in 1830, because of the closure of the University of Cervera, Balmes continued studying in Vic, on his own. On 8 June 1833 he received his degree in theology. On 20 September 1834, in the chapel of the episcopal palace of Vic, Balmes was ordained a priest by bishop don Pablo de Jesús Corcuera. He continued his studies in theology and of Canons, again at the University of Cervera. 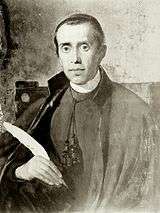 Finally, in 1835, he received the title of Doctor of Theology and Bachelor of Canons. On 7 September 1844, he wrote and published "The true idea of value, or thoughts on the origin, the nature and variations of the prices" in which he solved the calue paradox, clearly introducing the notion of marginal use, Balmes asked himself, "Why a precious stone has a higher value than a piece of bread?" La Civilización, Tom. II, Tom. III, Brusi, 1841-1842. El Protestantismo Comparado con el Catolicismo en sus Relaciones con la Civilización Europea, Tom. II, Tom. III, Tom. IV, José Tauló, 1842-1845. El Pensamiento de la Nación; Periódico Religioso, Político y Literario, Tom. II, Tom. III, Imprensa de E. Aguado, 1844-46. Fundamental Philosophy, Vol. II, D. & J. Sadlier & Co., 1871-1880. In Menczer, Béla, 1962. Catholic Political Thought, 1789-1848, University of Notre Dame Press. "Reading is like eating; the benefits are not in proportion to what is consumed, but to what is digested." ↑ 3 vols., 1842–1844, 6th edition, 1879; English translation in 1849 and also in 1856 by Charles Ignatius White. ↑ One or more of the preceding sentences incorporates text from a publication now in the public domain: Chisholm, Hugh, ed. (1911). "Balmès, Jaime Luciano". Encyclopædia Britannica. 3 (11th ed.). Cambridge University Press. p. 284. ↑ 4 vols., 1846, Eng. trans. by H. F. Brownson, 2 vols. New York, 1856. Clark, Kelly James. "Spanish Common Sense Philosophy: Jaime Balmes' Critique of Cartesian Foundationalism," History of Philosophy Quarterly, Vol. 7, No. 2, Apr., 1990. Davis, Harold Eugene. "Jaime Balmes, Spanish Traditionalist: His Influence in Spanish America," The Americas, Vol. 35, No. 3, Jan., 1979. Marshall, Odum Walter. Jaime Balmes and the Politics of Reconciliation in Spain, 1843-1848, Ph.D. Dissertation, Florida State University, 1978.